Can you smell that everybody? No, the person next to you didn’t just rip one. I’m talking about hockey. IT’S BACK. With the new season, we have a whole host of new features that have the potential to make this one of the most exciting NHL seasons in recent memory. We’ve got hybrid icing, more space in Gretzky’s office, and smaller goalie pads. We’ve got realignment that will give us back so many Original Six matchups with Detroit, Montreal, Toronto, and Boston all playing in the Atlantic Division. Fasten those seatbelts young bucks, we’re in for a ride. Stat #1 – The last NHL team to repeat as Stanley Cup Champions was the 1997-1998 Detroit Red Wings. In the Salary Cap Era (2005-present), only 1 team that has won the Stanley Cup has made the Finals the following season (2008-2009 Detroit Red Wings, lost in 7 games to the Pittsburgh Penguins). 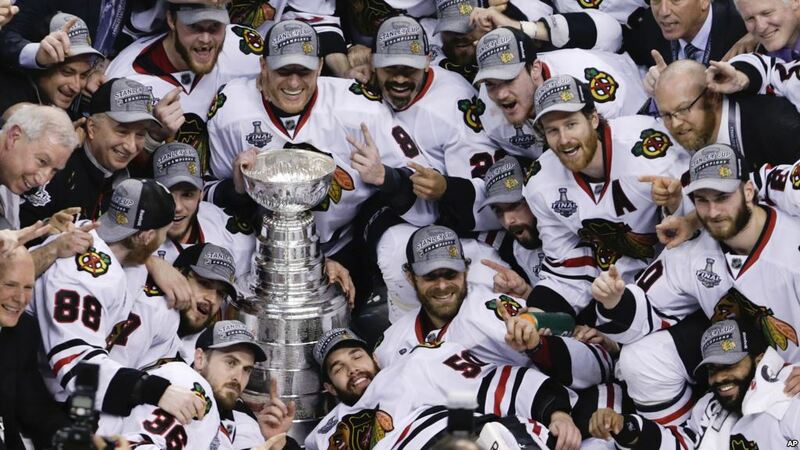 So what does this mean for our defending champion Chicago Blackhawks? Well, in my personal opinion, this Blackhawks team is probably the best equipped team to repeat since those 2008-2009 Red Wings (who failed). They return the entire core of the lineup, but the major question is how much will they miss veterans such as Dave Bolland and Michael Frolik. The Blackhawks will be counting on key contributions from youngsters such as Jimmy Hayes, Joakim Nordstrom, Brandon Saad, Andrew Shaw, and Ben Smith up front. If you’re keeping track at home, those 5 forwards have a combined 194 games played in the NHL with 41 goals to show for it. Guys like Shaw, Smith, Hayes earned valuable experience in the postseason last year and we will have to see if that translates to regular season success. In my personal opinion, I do not believe that the Blackhawks will repeat as Stanley Cup champions, but I do believe that this team is poised to contend for the next 5-7 years. Stat #2 – The runner-up in the Stanley Cup Final has won the Stanley Cup the following season just two times in the last 44 years (2009 Pittsburgh Penguins, 1984 Edmonton Oilers). On the other hand, the Stanley Cup runner-up has failed to qualify for the postseason four times in the last 10 years (2004 Anaheim Mighty Ducks, 2007 Edmonton Oilers, 2008 Ottawa Senators, 2013 New Jersey Devils). So what does this mean for our runner-up Boston Bruins? Well this team is far too good to miss the playoffs this year. They are loaded upfront with talented forwards and still have a stingy blue line with a sensational Tuukka Rask in goal. However, the playoffs did expose some weaknesses. Is what we saw of Zdeno Chara in the Stanley Cup Finals an aberration, or a sign that Father Time is starting to catch up to the big man? In the final three games of the Finals, Chara was an incredible -6. The Blackhawks forwards openly talked about how they felt that they could attack Chara and that there was no reason to fear him. Granted, not every team has forwards of the same caliber as the Blackhawks, but realignment has put some very tough forwards in the same division as Chara. Chara will have a combined 16 games where he will face either Pavel Datsyuk/Henrik Zetterberg, Steven Stamkos/Martin St. Louis, Phil Kessel/Joffrey Lupul, or Jason Spezza/Bobby Ryan. Is the big man still up to the task? If not, the Bruins might find themselves in trouble. However, I firmly expect the Bruins to finish either 1st or 2nd in their division and contend for the Stanley Cup – I just don’t see them winning it with the age on the back end and the introduction of new forwards to the system. Stat #3 – Since the beginning of the Salary Cap Era (not including the 05-06 Carolina Hurricanes in this), the Stanley Cup Champion has played an average of 14 games in the playoffs the year before. The fewest played by any champion in this era is six (2013 Chicago Blackhawks, 2012 Los Angeles Kings), and the most played is 20 (2009 Pittsburgh Penguins). If that minimum of six games holds true, that will leave us with the following teams as Stanley Cup contenders: Pittsburgh Penguins, Ottawa Senators, New York Islanders, Washington Capitals, New York Rangers, Boston Bruins, Toronto Maple Leafs, Chicago Blackhawks, Anaheim Ducks, Detroit Red Wings, San Jose Sharks, St. Louis Blues, and Los Angeles Kings. So we’ve got 8 teams from the East and 5 teams from the West that appear to be prime contenders. Many of you might point out that this could have been fairly obvious without having to use this stat, but I always find this statistic interesting because it can also be predictive of playoff success. If we go back to 1997-1998, teams that played more games in the playoffs the year before won the playoff series 56.1% of the time. Stat #4 – Since the Salary Cap Era, 5 of the 8 of the Stanley Cup Champions had a Norris Trophy Winner on their team (only the 2009 Pittsburgh Penguins, 2012 Los Angeles Kings, and 2006 Carolina Hurricanes did not). So who are our active Norris Trophy Winners? Erik Karlsson – Ottawa, Duncan Keith – Chicago, P.K. Subban – Montreal, Zdeno Chara – Boston, Chris Chelios – wait, no he’s still retired, Nick Lidstrom – just because you have to include his name in any discussion about the Norris Trophy. Basically, this statistic has left me with 4 teams that I like in the Stanley Cup race. So who’s my actual pick? I’m taking the Ottawa Senators as my Stanley Cup Champions, and I like them to meet the St. Louis Blues in the Finals. Ottawa will surpise many people. They have an ultra-talented playmaker in Jason Spezza, a top-notch goal scorer in Bobby Ryan, and secondary scoring from Cory Conacher, Milan Michalek, and Kyle Turris. They have veteran leadership from Chris Neil and Chris Phillips. They have a Norris Trophy winner in Erik Karlsson, and he’s complemented by an excellent shutdown defenseman in Marc Methot and a young up-and-comer in Patrick Wiercioch. Finally, they have a Vezina-caliber goaltender in Craig Anderson. They will get plenty of in-season experience having to face the Detroit Red Wings and Boston Bruins multiple times throughout the season. They got great playoff experience last year. They have that “edge” in proving to Daniel Alfredsson and themselves that they are legitimate Stanley Cup contenders. Last but not least, they have a Jack Adams-winning coach behind the bench in Paul MacLean. He will steer this team through thick and thin. After saying this, I firmly believe that you should go bet on the Toronto Maple Leafs to win the Stanley Cup. Nope, just kidding. Never do that. As for my other predictions…..